Developed by Dr. Teruo Higa and manufactured by Amron, these small permanent nonporous ceramic cylinders are immersed in drinking water to remove chlorine, improve water homeopathically, make it more hydrating for plants and animals, and control odors. The pipes can be put in cooking oil to extend its shelf life, in bath or shower water to improve cleansing and reduce soap consumption, and in water used for watering plants. The cylinders do not remove fluoride from water. Because the surface tension of water is reduced with K-Type ceramics, water becomes a better solvent for washing, and more hydrating for drinking or watering plants. The ceramic also emits far-infrared rays which change the bond angle and molecule clustering of water, lowering its surface tension, making it "wetter" and more hydrating, and having other benefits for living organisms. See the work of Dr. Martin Chaplin, Viktor Schauberger, and Dr. Teruo Higa for more details on the science of water. The far infrared waves (heat) also gently warm nearby objects, so the cylinders can therefore be used to warm and sooth parts of the body, and possibly provide other benefits. Far infrared therapy in general has many uses. Amron K-Type Ceramic Pipes (High Temperature), 1 Bag has been added successfully to your wishlist. K-Type Ceramics are made by mixing volcanic clays with Teruo Higa's Effective Microorganisms. The microbes eat the minerals and create angstrom and monatomic minerals which allow the clay to emit scalar and infrared waves. 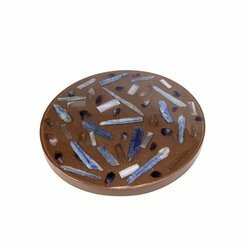 The clay is then fired at "high fire" stoneware temperatures to harden the clay, making it vitreous (nonporous) and locking in the energy emitting structure. The lower earthenware firing temperature allows the clay to remain porous so it can better adsorb chemicals dissolved in water. K-Type Ceramics emit far infrared waves, which are the longest rays in the light spectrum. This wavelength is highly compatible with human tissue. The body can absorb them easily at depths up to 3 inches, where they have many benefits. Far Infrared waves remove blood cell clusters (Rouleaux) which improves blood circulation. Increased blood circulation removes toxins from muscles and internal organs, lowers blood pressure, and improves overall body function. Far infrared waves generate a warming effect by activating cells. NASA uses far infrared wave technology in the space suits of their astronauts. Try this chemical-free, alternative to enhance your blood flow. 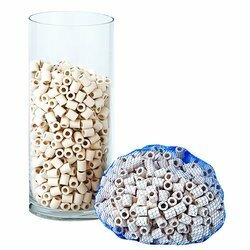 One bag of K-type ceramics contains over 100 cylinders (500 grams) and treats 275 gallons of water. When used in a drinking water dispenser, using 10 gallons of water per week, one bag of ceramics will last about six months before needing to be cleaned and recharged (see details below). Use the entire bag, or remove some and add to smaller containers. 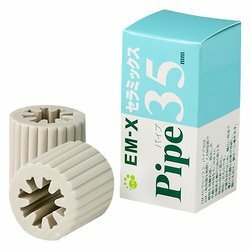 Best when used with Amron S-Type Ceramic Pipes and EM-X 35mm Ceramic Pipes. Place 1 bag in drinking water dispenser, will treat 275 gallons of water. Good to use with S-Type and EM-X Ceramics in dispenser for ionized alkaline drinking water. Place 1 bag in the average sized bathtub. Place 1 bag in toilet tank to keep water fresh, reduce stains, and make cleaning easier. For cut flowers, fill vase about 10% by volume with pipes before adding water. Place a handful inside shoes to keep them smelling fresh. Place a handful in a 20-gallon aquarium to reduce algae and cleaning. The ceramics emit an ultrasonic frequency (around 30 kilohertz) that will cleave, or break apart, water molecules and dissolved solids clusters. At the same time, the ceramics adsorb the impurities, making them “stick” to the surface of the ceramic unit. Over time, the surface of the ceramics will become coated with dissolved solids that it adsorbs. K-Type ceramics should therefore be cleaned and recharged by soaking them in Dr. Higa's Original EM-1 Microbial Incoculant for 24 hours about every six months. Life Span: Permanent. Clean and recharge approximately every 6 months by soaking in Dr. Higa's Original EM-1 Microbial Incoculant for 24 hours.